Thanks to George Washington, Abe Lincoln and their successors, you’ve got a three day weekend coming up this month. If you’re wondering what to do with the kids, I’ve got some suggestions for you. 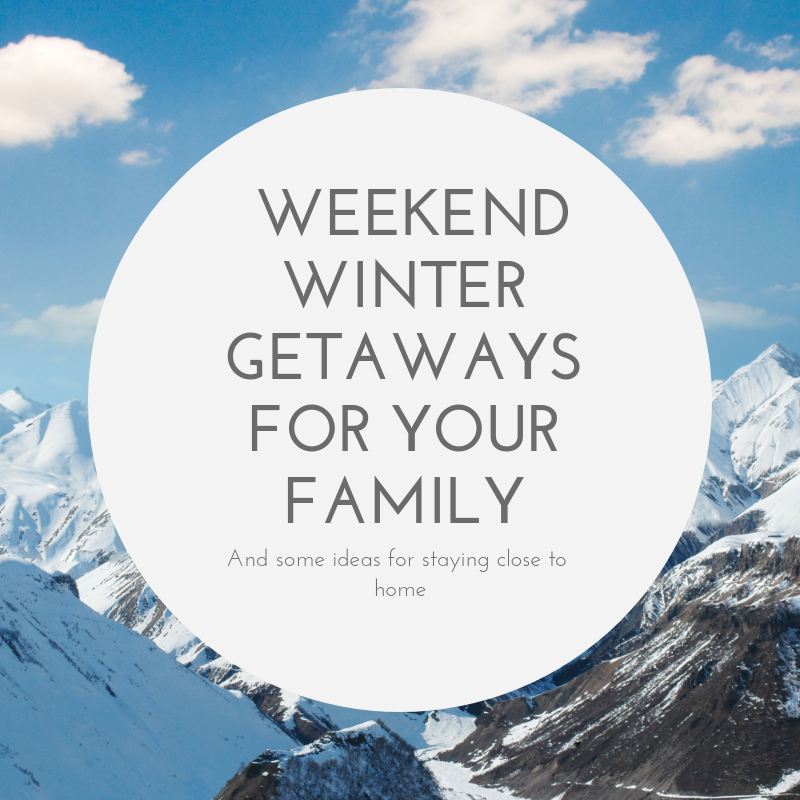 If you can take Monday off as well and want to plan a getaway, consider one of these popular winter family escapes. SUNCADIA RESORT. This Washington vacation spot is only a four hour drive from Lake Oswego and promises to pack a lot of winter fun into your weekend. Snow activities include cross country ski and snowshoeing, sleigh rides, guided cross country ski and snowshoe tours, ice skating, and a rope tow inner tubing hill. The Junior Rangers program has a lineup of themed activities planned for President’s Day weekend. Other recreational activities include Build a Bear, Tie-Dye Snow Art, Canvas and Cocoa and Bounceville with adult offerings that include a Mixology Class and Couples Paint and Sip. Accommodations include rooms in the Inn, Condos and vacation homes. 3600 Suncadia Trail, Cle Elum, WA., 866.904.6300. SUNRIVER RESORT. Oregon has its own answer to a family friendly winter wonderland that’s only 3 hours and 15 minutes from Lake Oswego. You can pack in a lot of fun without leaving the resort with an indoor pool and Surf Wave Machine, outdoor hot tub, year-round sledding hill, rock climbing gym, indoor basketball court, indoor tennis courts, and fitness studio rooms with classes like Zumba and Spin for adults and Beginning Ballet and Hip Hop for the kids. Don’t forget ice skating on the covered skating rink at the village mall. There is daily shuttle service to Mt. Bachelor which is only 20 minutes away and nearby sno-parks like Edison and Wanoga offer sledding and snow tubing. Accommodations include the lodge and vacation rentals. 17600 Center Drive, Sunriver. 855.420.8206. BLACK BUTTE RANCH. Located just seven miles west of Sisters, Black Butte Ranch is a popular getaway for many Lake Oswego families. The Hoodoo Ski Area is only 13 miles away with options for downhill and cross country skiing, skating and a tubing park. Sledders will enjoy Santiam Sno Park just across the street from Hoodoo. Back at the ranch, you can take advantage of the groomed trails around Big Meadow or Glaze Meadow Golf Courses for cross country skiing and snowshoeing as well as a sledding hill near the Glaze Meadow parking lot. Rent fatbikes to go exploring or head over to the Glaze Meadow Recreation Center to enjoy the indoor pool and fitness equipment. Accommodations include condos and vacation homes. SKAMANIA LODGE. If your kids are older and aren’t afraid of heights, Skamania offers a Zipline Course with seven zip lines from 100 to 900 feet long, and three sky bridges. The guided tour should take about 2.5 hours. For the more adventurous (and strong) the Aerial Park has 19 platforms and 22 elements of varying difficulty to test your ability and balance. It’s all outdoors in the forest so you’ll want to bundle up. Back at the Lodge, you can warm up in the outdoor hot tub, enjoy the indoor pool and mini golf. The drive is only about an hour from Lake Oswego and the lodge is offering 20% off during their winter getaway special through February 28. Just enter the promo code WIN2019. Accommodations include guest rooms in the lodge but for a different experience check into one of their tree houses! 1131 SW Skamania Lodge Way, Stevenson, WA. 844.432.4748. TIMBERLINE LODGE. This grand majestic spot invites you to just bundle up and stay a spell. But skiing is right outside your door as well as a ¾ mile groomed snowshoe trail. Be sure to pet resident St. Bernards Heidi or Bruno on your way out the door. When you come back in to warm up, enjoy the heated outdoor pool and hot tub, game room with shuffle board, ping pong table and board games and the fire in the towering stone hearth. Extend your stay an extra day and enjoy the Full Moon Snowshoe Stroll Tuesday night, February 19. Accommodations include rooms in the lodge as well as six condos six miles away at Government Camp. 27500 E. Timberline Road, Timberline Lodge, OR. 800.547.1406. GREAT WOLF LODGE. Leave the snow behind and check into the Great Wolf Lodge with an indoor water park that is guaranteed to wear your kids out. Dry land activities include a ropes course, indoor miniature golf, and arcade and indoor fitness center with character appearances sure to delight the younger set. Located in Washington, the drive is only about 1 ½ hours from Lake Oswego. 20500 Old Highway 99, SW, Centralia, WA. 800.640.9653. If you decide to stay close to home, here are a few things you can do without leaving the Portland metro area. ICE SKATING. Check out sessions at the Winterhawks Skating Center in Beaverton, Lloyd Center in Portland or the Sherwood Ice Arena. CHINESE NEW YEAR CELEBRATION. The Lan Su Chinese Garden will be celebrating the Chinese New Year from February 5 through the 19th with special hours from 10:00 a.m. to 5:00 p.m. Activities include lion dances, cultural performances, martial arts, calligraphy, wishing tree activity, crafts and lantern viewing. Check the complete schedule. AVALON THEATRE AND WUNDERLAND. Get out your nickels! This throwback hangout features 100 arcade games which after a small admission charge only cost a nickel a game. Could keep your kids busy for a while! Laser tag is available too. Check out the movie schedule as well and you can make an afternoon of it. 3452 SE Belmont Street, 503.238.1617. HARRY POTTER AND THE PRISONER OF AZKABAN™ IN CONCERT. The Oregon Symphony has geared this concert towards the up-and-coming music lovers with a popular storyline and shortened performance. Costumes are encouraged. At press time, tickets to the Sunday evening performance on February 17 at 7:30 p.m. were still available. Stay current on what’s happening in and around Lake Oswego by signing up for my blog. Click the “Sign me up” button in the top right hand column and receive weekly updates! This entry was posted in Seasons in Lake Oswego Oregon, Things to Do in Lake Oswego and tagged Black Butte Ranch, Lake Oswego Oregon, President's weekend, Sunriver Resort, Timberline Lodge, Winter getaways. Bookmark the permalink.